bizarre incident took place in Mangaldai town at about 10 pm which has created sensation here. As reported, a team of police led by Darrang Superintendent of police Amrit Bhuyan acting on a tip off signaled a loaded truck in high speed at Sipajhar. But the driver of the truck without caring for the police signal tried to run away towards Mangaldai on NH 15. The police team made a hot chase and subsequently informed it to Mangaldai police. 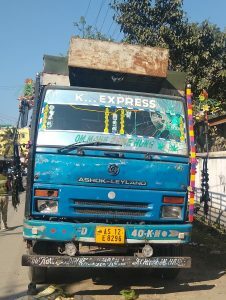 Even at Mangaldai town , the driver of the truck defied the police signal and tried to flee away Mangaldai-Tangla road in accelerated speed. The driver drove the truck through the Islampur-Karimchowk road and at Karim Chowk of the town reportedly took a dangerous turn nearly causing severe casualty to the police team. However, the police succeeded in intercepting the truck near district library only after open firing and arrested both the driver and the handyman of the truck bearing registration number AS 12 E 8296. Police station and police investigation is on to bring out the actual truth. On the other hand the driver of the truck has claimed that he got valid legal documents for everything but he tried to run away only to get rid of alleged harassment from the police at night .